If you are reading this at Christmas, you are more likely to have your hand up. People love to bake for the holidays, more than any other time of year. 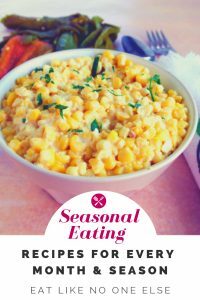 It just so happens to be that time of year now as I write this but this guide as god any time of year – just as it’s fun to bake any time of the year. I had someone ask me, whether or not Trader Joe’s carried baking supplies like powdered sugar. I assumed that they did but had no bought many baking ingredients there. Since their stores are smaller, they may not carry as many products as a large supermarket. I thought it would be a good time to look what Trader Joe’s has to offer in the baking department. This guide will share with you the basic baking ingredients and what they cost. Sprinkled in will be some tips and recommendations. 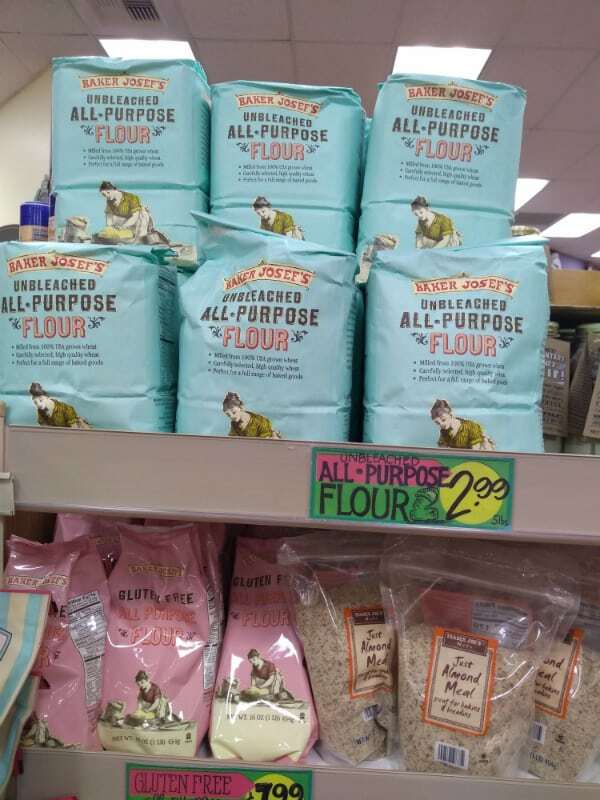 On top – Trader Joe’s sells unbleached all-purpose flour with their Baker Josef’s name. On botto – Gluten Free All-Purpose Flour and Trader Joe’s Just Almond Meal. Almost anytime you are baking flour is involved. So let’s start there. Here are the types of flour I found at Trader Joe’s. I am all about using unbleached flour. The less processing done the better. Bleaching flour is the process of using chemicals to make the flour appear whiter. The bleaching process can soften the flour to produce a more tender baked good. However, in most cases I think only the most sensitive tastier can tell the difference. That is why I opt for unbleached flour because it wasn’t treated with bleaching chemicals. Trader Joe’s all purpose flour is unbleached. The price of $2.99 for a 5 pound bag, is not the cheapest, not the most expensive. At other stores I can get unbleached flour for cheaper but not everywhere. The Whole Wheat Flour is actually the same price as the all-purpose. Typically it can be more expensive. Trader Joe’s does sell gluten free flour which is good to see. I have not used theirs before. I am a fan of Jessica’s Gluten Free flour – that is the brand I recommend people buy that are looking to avoid rice flour or just looking for a good gluten free option. Both almond flour and almond meal appear at Trader Joe’s. The meal differs is that it is a more coarse grind than the flour. You can use them interchangeable in some cases, but I would stick with flour when are making something like a cake where you want a fine grind. Most cookies could use both, macaroons I would use the flour though. Trader Joe’s sells organic sugar. We got the flour, naturally sugar would be next. Here are the offerings at Trader Joe’s. Organic is the name of the game for sugar. Great if you are looking to avoid GMO beet sugar or just looking for organic. There isn’t a cheap sugar option, so it’s organic or nothing. The inspiration for those post was a friend asking about powdered sugar, so they do indeed have it. Careful note that while the brown sugar and cane sugar are the same price, they are different sized bags. 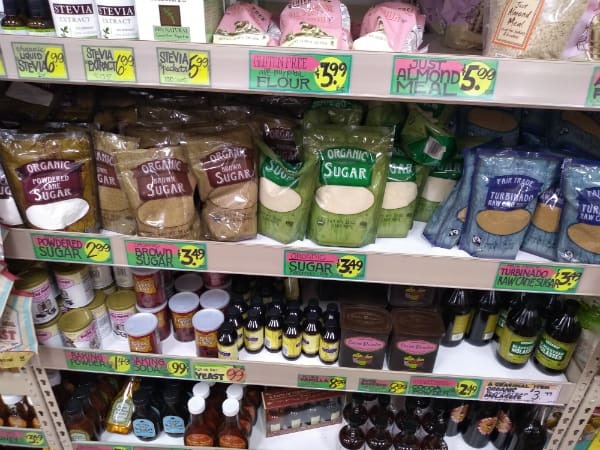 Trader Joe’s also have Turbinado sugar, also called Demerara sugar. I love it for adding a nice crunch to the top of baked goods as it doesn’t melt like white sugar. Ginger snap cookies with turbinado sugar on top is a favorite. Turbinado is less processed and has a deeper flavor. I think the Trader Joe’s brand spices are of better quality than most supermarket brand spices. So often spices take baked goods to the next level. Think cinnamon rolls. Think ginger snap (yes it is December, so I got them on my mind), think pumpkin pie. The prices are a bit more than other store brand spices, but I think the quality is better. 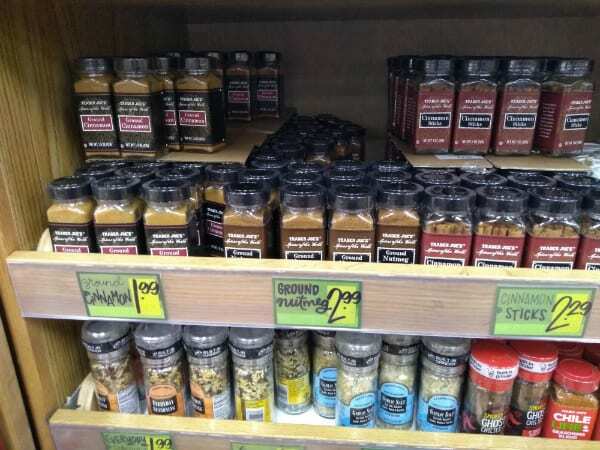 Since Trader Joe’s is a smaller store, inventory is turned off faster, so the spices you find might be fresher. Sometimes I wonder how long they sit on store shelves at the big supermarkets. Sorry I didn’t grab the sizes of the containers. They were pretty standard size. I do like that they have cinnamon sticks, in case you want to grate yourself for a fresher flavor. I don’t like that they don’t have whole nutmeg as it so much better than ground. I only use whole nutmeg now and I grate it with my Microplane. 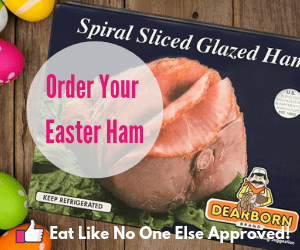 Your leavening friends – baking soda, baking powder, and yeast. Time to look at some of the other basic baking ingredients you’ll need for a lot of different recipes. 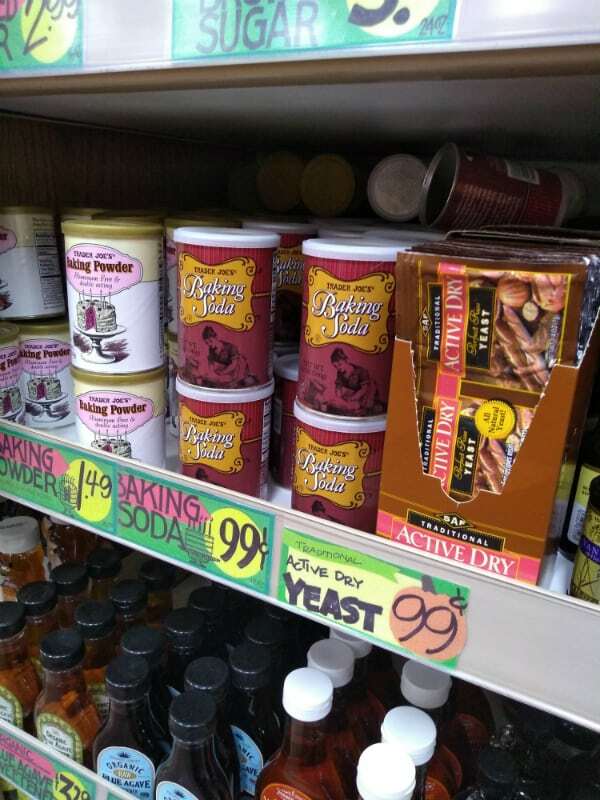 Biscuits, yeast breads, and brownies we got you covered with baking powder, baking soda, yeast, and vanilla extract. Trader Joe’s sells a different type of vanilla that actually contains sugar, so if you want the pure extract make sure you read the label. A packet of yeast is equal to 2 1/4 teaspoons of yeast. I love baking with these chocolate chunks. It saves me the time of having to chop up chocolate. Now onto my favorite part the chocolate. Here are a few ingredients you may want to bake with. As you can see they have both cocoa powder and cacoa powder. What’s the difference? Cacoa powder is raw and cocoa powder has been heated. People choose cacoa because they believe it has more nutrition benefits because of its raw state. 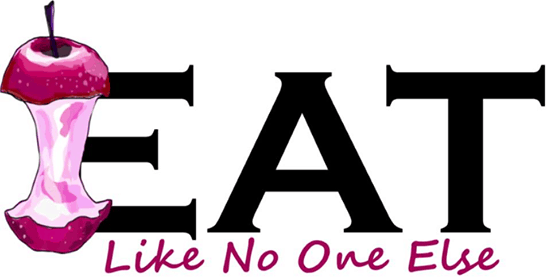 Of course if put into something you eat up, then those nutrients that may only exist in raw form will still be dimished. The thought is that they are more of them to begin with. What there is also more of is cost. Cacoa powder is more expensive. Unless you are confident that cacoa powder is going to be better for your health, than just stick to cocoa powder. As far as taste goes in the finished product, I have not yet noticed a significance difference, but I am still experimenting with cacoa powder. My favorite ingredient on this entire list is the chocolate chunks. These aren’t like the Nestle chocolate chunks that are uniform squares of chocolate. 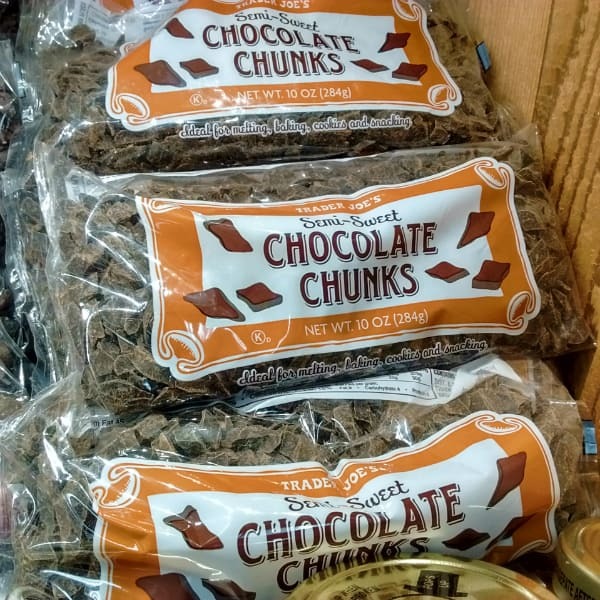 These chunks are what you would get when you cut up a bar of chocolate for baking purposes. They are not uniform. The time savings on them is the big draw for me and why I buy them again and again. For this last section, I didn’t do exact prices. There are just too many dried fruits and nuts to choose from. The selection of nuts is great and I think the prices are good too. The dry fruit is what I really love. The wild dried blueberries pack so much flavor. Soft too. The dried cranberries are priced well. The jumbo raisin medley is another favorite. Any of these would make great baking fodder as long as you can get them into your dough before you eat the bag. Trader Joe’s also has freeze dried fruit. I love taking those and putting them into my food processor, along with sugar. I use that as a topping on cereal or I add some water and turn them into an icing for sugar cookies. The most flavorful icing ever and it contains real fruit, so it’s healthy, right? 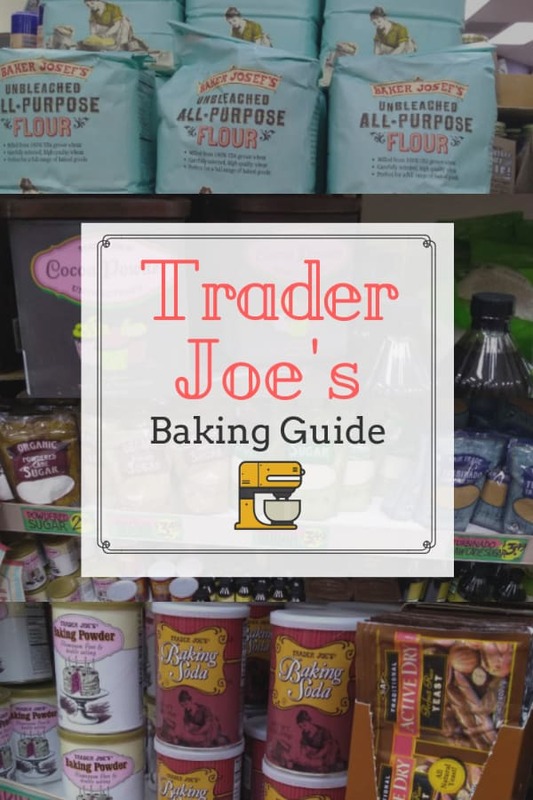 Don’t see your favorite Trader Joe’s baking ingredient on this list? Leave a comment below sharing your favorite. Also if you are interested in baking with honey, check on over to your Trader Joe’s honey post to learn more about their sweet offerings.